Sugar and boyle it up for a qr of an houre with a Quick fire, then put it into your Glasses or pots how to make Conserve of Roses Take your Red Roses buds & Clip of the whites & put them into a posiett & put as much water as will well cover it & boyle them till they be very tender wch will ask two hourse & a halfe before the Liquid be Clear boyled away then take them of & beat your Sugar very fine & put three times the weight of the Roses before they be Cold, Arain it into the posuet alwayes Stirring it till your Sugar is well desolved, have a care it Stick not, & then take it off, let it Stand till it be Cold, & put it into a pott & covered it well. TO Preserve whole quinces white. Take the [fearest?] 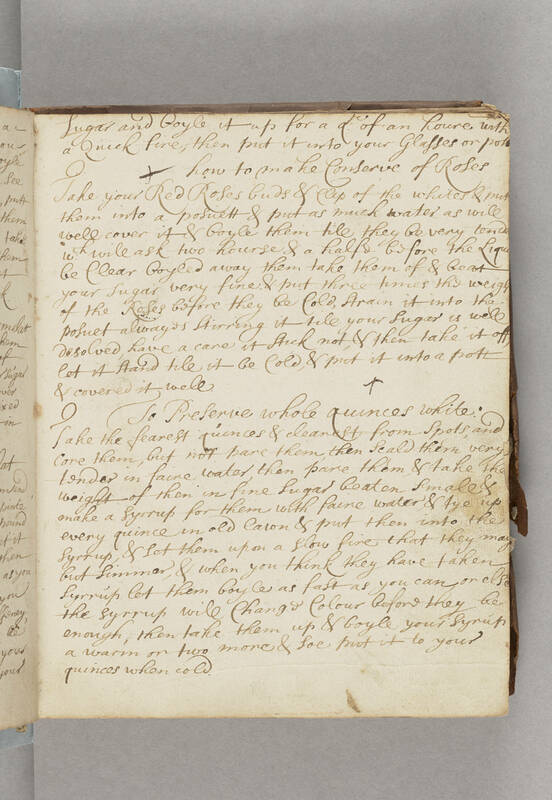 quinces & cleanest from Spots, and core them, but not pare them, then Scald them very tender in faire water, then pare them, & take the weight of them in fine Sugar beaten Small & make a Syrrup for them wth faire water, & tye up every quince in old Caron & put them into the Syrrup, & Let them upon a Slow fire that they may but Simmer, & when you think they have taken Syrrup let them boyle as fast as you can or else the syrrup will Change Colour before they be enough, then take them up & boyle your Syrup a warm or two more & Soe put it to your quinces when cold.